Three simple, but powerful letters. 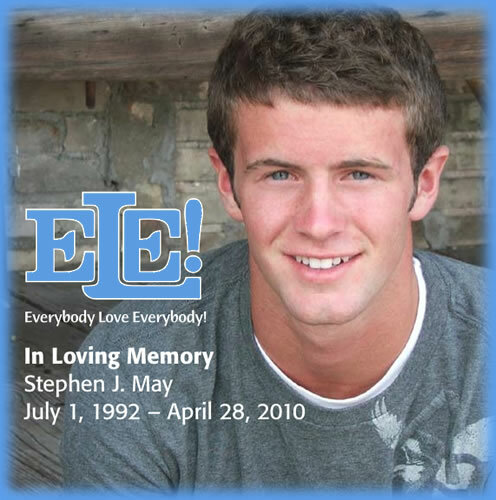 ​ELE!, or "Everybody Love Everybody" was Stephen May's Facebook status since he acquired a Facebook account at age 15. Stephen passed away on April 28, 2010, from a tragic accident. Stephen was a peace maker and an inspirational friend to many in his hometown of Rockford, Michigan. Stephen's friends recall that whenever someone was at odds with another, he would often say, "ELE guys!" or be understanding, compassionate, and kind to each other, and keep an open heart and open mind.